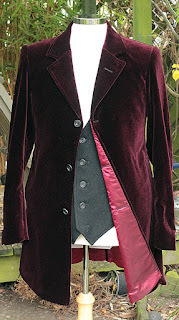 Making my 12th doctor costume: Doctor Who mag - ANOTHER new coat?? Doctor Who mag - ANOTHER new coat?? Today I found the latest issue (502) of Doctor Who Magazine on my doormat. It’s the first issue to feature new imagery from series ten, currently in production. 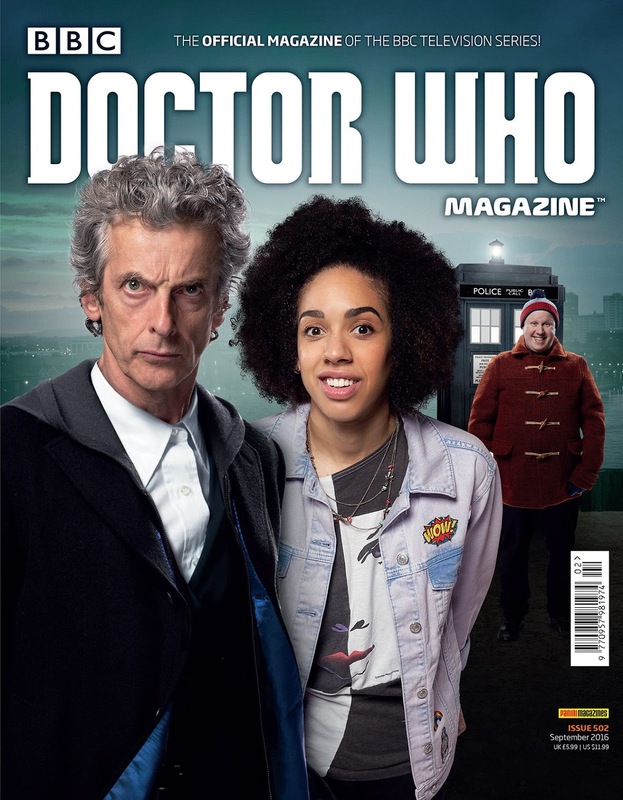 Not unsurprisingly the cover features Peter in his new costume, alongside Pearl MacKie as new companion Bill and Matt Lucas as returning as Nardole. As an aside, that TARDIS doesn’t look quite right to me - it looks more like a Tennant’s version than the Capaldi, but I might be wrong. Now, am I the ONLY person so far to spot that this is NOT the same coat that Peter has been seen wearing so far on location for series ten? From what we have seen, the new coat is a black velvet frock coat-style, with a light blue lining. 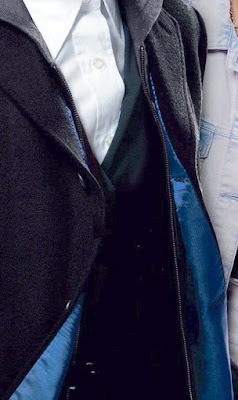 Obviously the coat in this photo is also black with a light blue lining, but looking closer the way the shoulder is catching the light it is not velvet and looks more like a wool coating cloth, akin to the previous navy blue crombie-style coats he wore in series eight and nine. 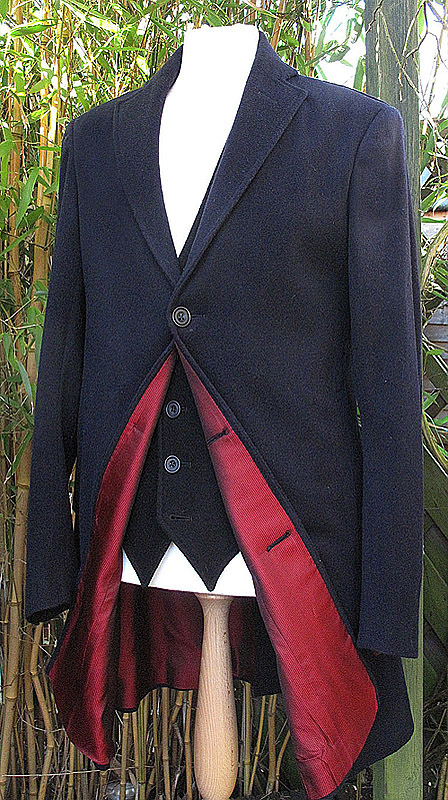 Furthermore, although it has been covered by the hood of the hoodie, the velvet coat has a revere lapel (where the lapel tip points upwards instead of down) and this coat clearly has a conventional downward pointing lapel with a classic single faux-buttonhole. The edge of the lapel is also topstitched, whereas the new velvet coat is not. It’s hard to see the closure buttons, but these do not appear to be the new mother of pearl style vintage buttons and look a lot darker, possibly being the same black horn buttons as on the crombies. 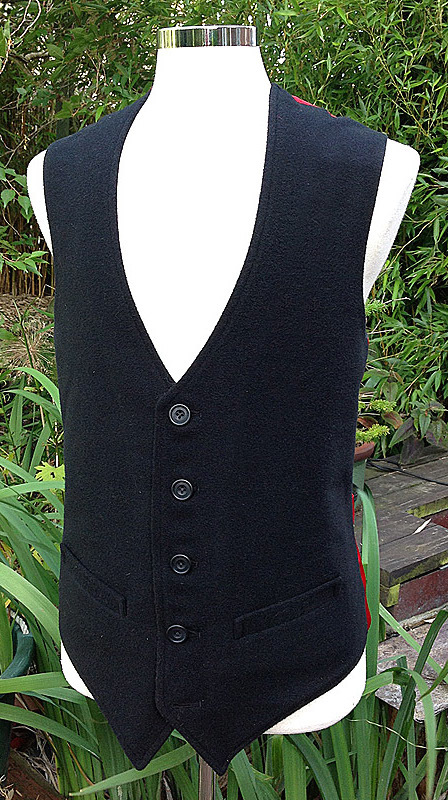 NB: I have massively lightened the image below to pull out some detail to show the buttons and lining. The lining, although the same colour as the velvet coat, looks to be going to the leading edge of the coat in the same way as in the crombies (the new velvet coat has a distinctive step in the edge of the lining at the was it level). So is this a new BLACK crombie with a blue lining? What do you think? Well observed, I must that I have glanced that this cover a dozen times and never noticed is wasn't the velvet coat! I think that this is a promo pic from Series 9 photoshopped to look like Capaldi's new outfit. You can see on the picture you lightened that some of the holes on his jumper are still present. Almost certain this is an edit. Here’s a shot from the photo shoot I think the base image is from. There are slight differences in his facial expression and head angle, but his hair is styled exactly the same in both. It's not like the don't employ Peter to be around for photoshoots. I think thy do it simply to keep us in the dark until the series premiere. Thank god we have you Steve because your talent in sorting this out is truly inspiring. Thx for your hard work! Series 10 filming: it’s alright for some!